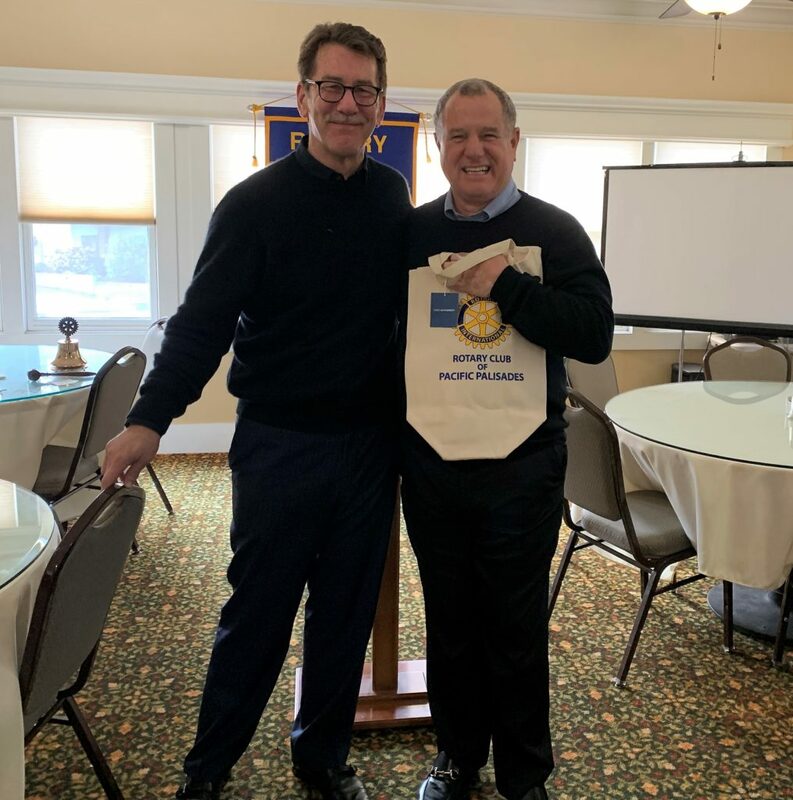 Rotary President Brett Bjornson presented speaker Jimmy Dunne with a Rotary reusable bag. 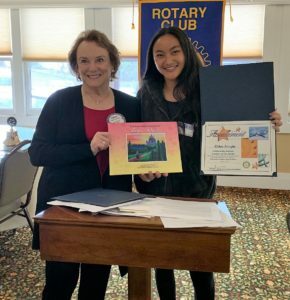 At the March 7 Palisades Rotary Club meeting, Palisades High senior Chloe Smigla received the monthly Rotary Community Service award. Smigla, who has completed her Girl Scouts Gold award, has written a children’s book on gender equality, “Lena’s Quest,” with pages illustrated by artistic friends. The book is available on Amazon and can be viewed on her website: girlshavegoals.com. Rotary member Marka Midwin presents a community service award to Chloe Smigla. Working together, Smigla and her sister Tessa have produced documentaries, and won awards at the Paul Revere Film Festival. The sisters are the adopted children of Palisadians Lisa Robins and Terry Smigla. 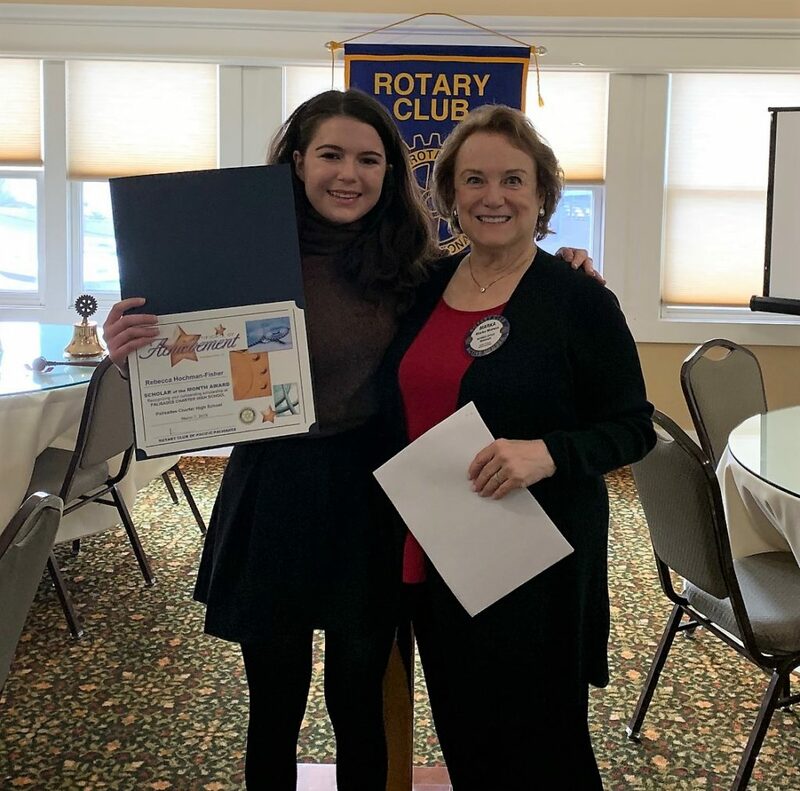 Rotary’s monthly academic award went to PaliHi’s Rebecca Hochman-Fisher. Not only did she organize voting drives for U.S. House candidate Katie Hill in the 25th Congressional district last fall, she helped create an eco-garden at Palisades High that is irrigated through rain-water capture. Hochman-Fisher helps with the “Girls Who Code” club at PaliHi and plans to attend Middlebury College this fall. Palisades resident Jimmy Dunne spoke about the Veterans’ Park/bocce project at the Palisades Recreation Center and the trials of working with the City on independent projects. He said that this would be one area of the park that seniors would be able to use, unlike the baseball fields or basketball courts, which are skewered more towards youth. After Dunne explained the proposed site (south of the upper lawn, the area where the picnic tables are located, close to the tennis courts), one Rotarian wanted to know about the picnic tables, because she said they are used by the public. Dunne assured her that each of the five “living rooms”—the term used not only by Dunne, but is also on the website (veteransgardens.net)–would have picnic tables. Each area will pay tribute to a branch of the armed services: Navy, Marines, Army, Air Force and Coast Guard. Another Rotarian wanted to know about the parking at the Rec Center. He said that it is already difficult to find a place to park and if bocce and Veterans’ Gardens bring in extra traffic, it might be a problem. Dunne said they planned to hire a veteran who would not only be tasked with preventing the illegal parking that now plagues that lot but would also be able to act as a concierge if someone wanted to order food from a local establishment. Rotary member David Card, who served on the Potrero Canyon Park committee, explained that when this park opens one day, an additional 10 parking spaces will be created in parking lot, mostly by cutting into the center circle (where the pine trees died, due to lack of watering). Circling the News asked who would pay the veteran’s salary, and Dunne said they planned to fund it through the project. This project initially started over five years ago in January 2014, when Dunne approached the Palisades Park Advisory Board about bocce ball courts/park. In April 2015, the PAB approved a conceptual drawing of the Palisades Bocce Gardens (PBG). In July the Facility and Maintenance Task Force of the Board of Commissioners of the Department of Rec and Parks endorsed the Palisades Bocce Gardens. In July 2016, the PAB approves the PBG as depicted in the 50 percent construction drawings. The next month, based on the drawings, Bill McGregor (The McGregor Company) estimated the cost of the project at $600,000. About $133,000 has been budgeted for landscaping, $124,000 for walkways, $53,000 for tables, benches and barbecues, $160,000 for bocce courts, $20,000 for final plans, $50,000 for contingencies, and $60,000 for three years of maintenance. In July 2017, American Legion Post 283 members approved a $400,000 matching grant, with the stipulation that the community donate $200,000 for the Veterans’ Gardens and that there would be an assurance that the name Veterans’ Gardens would be unchanged for a 30-year minimum period. In September 2017, the PAB recommended that the Department of Rec and Parks approve the project. In April 2018, construction plans were accepted by Rec and Parks, with ground breaking set for February 1, 2019. Last December, Dunne and Bob Harter (a member of the Park Advisory Board, who has been working closely with Dunne) received a Pacific Palisades Citizen of the Year award for this project. Hochman-Fisher asked Dunne about the irrigation for the project and suggested that to make it sustainable they should consider rain barrels. Dunne agreed to speak to her after the meeting. Rebecca Hochman-Fisher was given the academic student of the month award by club member Marka Midwin. The PaliHi senior suggested to Dunne that the Veterans’ Garden committee examine sustainable irrigation for the project.